For information on purchasing a traditional yurt, email Alan Wenham of Albion Canvas for his excellent “Yurt Buyer’s Guide”. It’s important to take as much care in choosing a yurt company as you do in choosing the yurt design itself. Beware of companies that make extravagant claims, like having the best or strongest yurts at the lowest price. Also, don’t judge a company solely on its Web site. If you have questions about a yurt company, ask for customer references and check with their local Better Business Bureau. See if the company has yurt customers near you whose yurts you can visit, or if they’re going to be in an upcoming trade show that you could attend (to see their yurts and meet them in person). Was your yurt delivered on time? Was everything included in the yurt kit when it arrived? Were there hidden costs you weren’t told about initially? How easy was it to put up your yurt? How helpful were the written setup instructions and deck plans? What kind of customer service support did the company offer? Are you pleased with the design and quality of your yurt? Have you experienced any problems? There are three major yurt companies in the United States: Pacific Yurts in Cottage Grove, Oregon, Colorado Yurt Company in Montrose, Colorado, and Rainier Yurts in Seattle, Washington. Yurtco in Burnaby, B.C., is Canada’s largest company. These companies have been around a number of years, they’ve successfully placed yurts in state and provincial parks, they have experience with building code issues, and they all have reputations for strong designs and excellent customer support. Each company has also, over the years, developed optional items (in response to customer requests) that can be custom ordered to deal with climate issues, solve various problems or simply make your yurt more comfortable. Be aware that companies may have options available that are not listed in their catalogues. Family businesses, like Nomad Shelter in Alaska, have been around for years making simple, elegant yurts for regional and custom markets. Regionally-based companies include Surely Yurts in Taberg, New York, and Blue Ridge Yurts in Floyd, Virginia. These smaller, regional companies keep their yurts affordable by keeping their overhead low, and if they are local to you, your shipping costs will be reduced. They are also able to offer local expertise on siting and climate issues. However, you may not get the some of the custom options, national experience and engineering backup that are a part of purchasing from a larger established company like Shelter Designs or Colorado Yurts. Some companies make yurts primarily for SCA (Society of Creative Anachronism) reenactment events. These yurt designs can be rustic and are usually more appropriate for camping style functions. While some SCA-based companies have upgraded their designs for year-round living (Yurts of America in Indianapolis, Indiana-formerly Great American Yurts-is one such company), it is important to ensure that their quality, engineering and customer service will be adequate to service your needs. A brand new design introduced to the market in 2007 is the camping yurt, which comes with a ground cloth (you can also build a platform) and can be set up by two people in under one hour. Two versions are available, from Go Yurt Shelters in Portland, Oregon and Rainier Yurts in Seattle, Washington. The real issue in buying a yurt is to determine what your priorities are and find the company that meets your needs most effectively. Here are some additional factors to consider. Customer service is especially important with yurt companies because, regardless of their seeming simplicity, (a) you’ve probably never lived in a yurt before, (b) you’ve probably never set one up before, and (c) yurt designs vary from one company to another. That’s why it’s important to have a knowledgeable yurt company customer-service representative just a phone call away with ready answers for your questions. Since the companies’ designs are different, many parts are not interchangeable between companies. This means that the company you buy from today is probably the company you’re going to be dealing with for the life of your yurt. Make sure you’re comfortable with them, that you like their design, and that they’re going to be around when you need to purchase replacement parts in two years, add awning options in five, or get a new wall or roof cover in ten or fifteen years. Be sure when you’re shopping for yurts that you explore the custom options that each company offers. There are some wonderful possibilities like French doors, water-catchment systems, pre-fabricated platforms and window awning conversion kits. Be aware that what are custom add-on items for one company may be part of another company’s basic package. Some features should be included in almost all yurt applications. Unless you are buying a door awning with your yurt, you should get a rain diverter (sometimes called a “cricket”) to go over any doors. On a rainy day the rain diverter will keep you from getting soaked as you enter the yurt, and it will prevent water damage to your doorframe. Other options worth serious consideration are the skylight dome opener for added ventilation in the summer and some kind of screen door or screen curtain for each door. 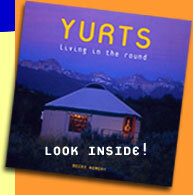 For further information on financing or setting up a yurt, purchase “YURTS: Living in the Round” on this site or find it at your local library. When I was working on my book (“YURTS:Living in the Round”) I found Pete Dolan to be one of the most consistently knowledgeable—and helpful—people in the industry. Pete’s work in Customer Service at Pacific Yurts www.yurts.com is one of the reasons the company maintains a legendary reputation for customer satisfaction. Pete agreed to share some additional thoughts with www.yurtinfo.org on the topic of buying a yurt. Many thanks, Pete! You’ll find Pacific Yurts online at: www.yurts.com, http://www.facebook.com/pacificyurts, and http://twitter.com/pacificyurts. It’s important to investigate companies to make sure they are reputable. One way you can do this is by checking with their local Better Business Bureau www.bbb.org to see if they have a satisfactory rating. It is worth checking to see if the company has changed their name, too, since there can be poor ratings for the company under previous names. Also check web blogs to see if you can find people who have purchased from the companies you are considering, to find out how satisfied they have been with the quality and service. Checking the company’s rating with Dunn & Bradstreet www.dnb.com can also give you a good indication if the company is likely to be around to help you in the future. If you are getting serious about buying a yurt, contact companies with any questions or concerns you have. I hear about people having problems that could have been avoided if they simply had called someone who is knowledgeable. For instance, I came across someone on a blog or forum that was having problems with condensation in their yurt. I contacted them to discuss the problem and it turns out that they were using an unvented propane heater in a wet climate, had an interior bathroom with no exhaust vent and never opened their dome skylight when it wasn’t hot outside. They didn’t realize that a by-product of burning propane is water vapor and if you don’t vent the exhaust to the outside you are adding a lot of water vapor into the living space. Since their bathroom didn’t have an exhaust installed, more water vapor was being introduced every time they took a shower. With all of this water vapor being brought into the structure and none being vented back outside I could understand why they had condensation. I explained that the more water vapor you bring into the structure, the more you will need to vent back outside in order to avoid water condensing on the interior. They switched to a vented stove and started opening the dome occasionally to allow warm moist air to escape, and the condensation problem went away. Also, don’t assume that a company doesn’t make a particular yurt option and exclude them from your purchasing decision because they don’t show a particular item on their web site. Sometimes we don’t put things on our web site that are likely to confuse prospective customers, or options that are specialty items that are not appropriate for most people. I’ve spoken with many people who had purchased from another company because they didn’t think we offered something they saw on another web site, only to have problems with the company and/or product later on. In some cases they find that we do offer a similar item but don’t promote it on our web site. Sometimes folks will call us to ask if we offer an item they saw on someone else’s web site only to find out that we have very specific reasons why we don’t offer that item, which can make a big difference in their long term satisfaction with the product. People tend to be sold on a feature rather than the potential benefits of that feature. Many times features sound good, but can realistically have very limited benefits and lots of disadvantages. Every person’s site, climate, use and individual needs and preferences will differ. Features that one person thinks are essential and should be standard may not be needed or wanted by someone else. A good example is wall height. Many people like having taller walls, but we also have a lot of customers who feel that a lower wall is preferable because of the intimate feeling inside and less space to be heated. I often see questions asked on blogs or forums that hang out there unanswered or inaccurately answered that could be quickly and easily answered if the person would have simply contacted a knowledgeable sales rep or checked the FAQ section of a good web site (e.g., www.yurts.com/what/faq.aspx). Twitter and Facebook offer additional venues for people to ask manufacturers specific questions or post their favorite yurt photos.